So you’re adulting. Now what? New York Times bestselling author of Adulting: How to Become a Grown-Up in 468 Easy(ish) Steps Kelly Williams Brown is here to tell you what, with her funny, charming guide to modern civility in these—yes, we'll say it—rather uncivil times. Graciousness is practicing the arts of kindness, thoughtfulness, good manners, humanity, and, well, basic decency. It’s not about memorizing every rule of traditional etiquette (though there is something to be said about a lovely hand-written invitation) or being the perfect hostess. It’s about approaching the world with compassion, conviction, and self-confidence—and it makes all the difference, whether you're at a Fancy Schmancy Intimidating Work Occasion or at the convenience store. 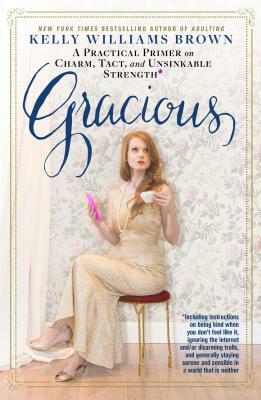 Gracious provides tips to help you deal with the people and circumstances that challenge all of us (pushy relatives, internet trolls), and thoughtful discussions on being the highest version of yourself. We can’t control the world, or other humans, or even how we feel in a given moment. The only thing we can control is our words and actions, and when we act deliberately and with kindness, it makes everything better. KELLY WILLIAMS BROWN is the founder of the popular Tumblr, AdultingBlog.com, and the New York Times bestselling author of Adulting. Previously, she was a features reporter and an award-winning humor columnist for the Statesman Journal, a daily newspaper in Salem, Oregon. She lives in Portland, Oregon.